Since its birth in 1974, the crown jewel of the Porsche lineup – the 911 Turbo – has remained true to its roots by giving up nothing in the pursuit of pure performance. 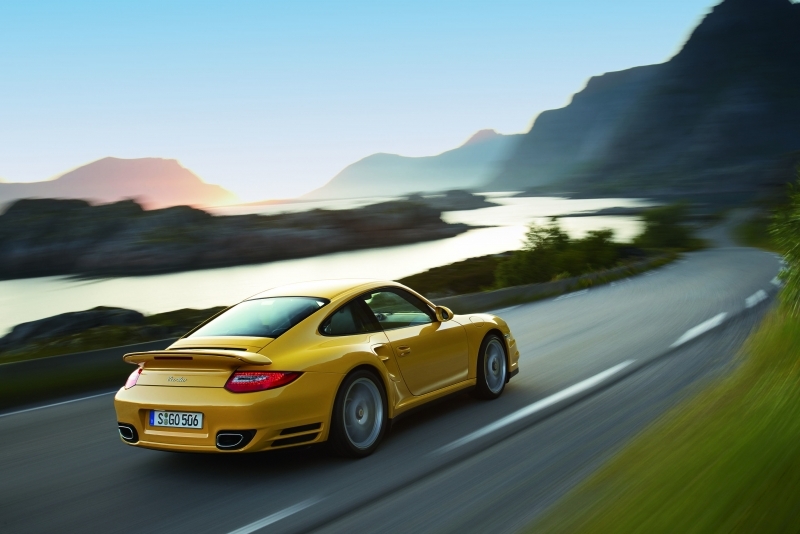 Fast forward thirty-five years and Porsche still demands the best from its top-of-the-range 911. On first glance, you’d be hard pressed to find anything new about the newest Turbo model; from the outside you can hardly see what’s changed in its lifetime, but after spending a number of hours driving one, it’s what’s under the hood, or, rather, over the rear axle, that matters. The subtle tweaks are what leave us wanting more after the first test drive, and each of them make this newest Turbo that much more wonderful. The interior, especially compared to the new Panamera, is somewhat lacking for a car at this price. 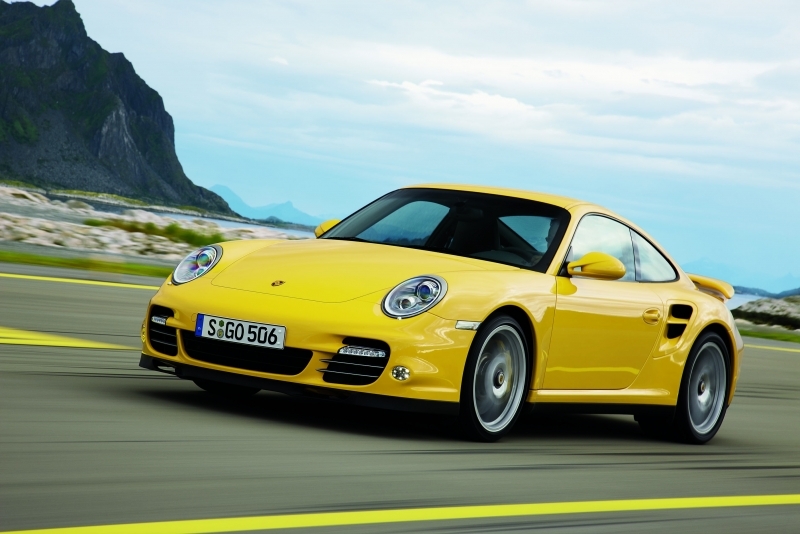 Also, it being a Porsche, everything – including seatbelts in yellow – is an option. That said, it’s hard finding fault with a car that performs this well. The 911 Turbo’s six-cylinder heart and soul rests in the rear, over the axle, and this is where Porsche has taken a knife to everything from the fuel injectors to engine mounts, making an already beautifully crafted piece of machinery ever more astonishing. As expected, it's fast and smooth and drives like nobody's business, which is to say, perfect. Porsche took the already robust and energetic horizontally opposed six-cylinder engine and made it go like schnell. The new Turbo engine puts out more power than its predecessor – 500 horsepower, up from 480 in the last iteration, and 516 lb-ft of torque (up from 460 lb-ft) when equipped with overboost, which is available in the optional – and highly recommended – $3470 Sport Chrono Pack. Combine that with an array of new components – exhaust, gearbox, Porsche Active Suspension Management (PASM), Porsche Torque Vectoring… well the list goes on, but they all combine to form an everyday super car. 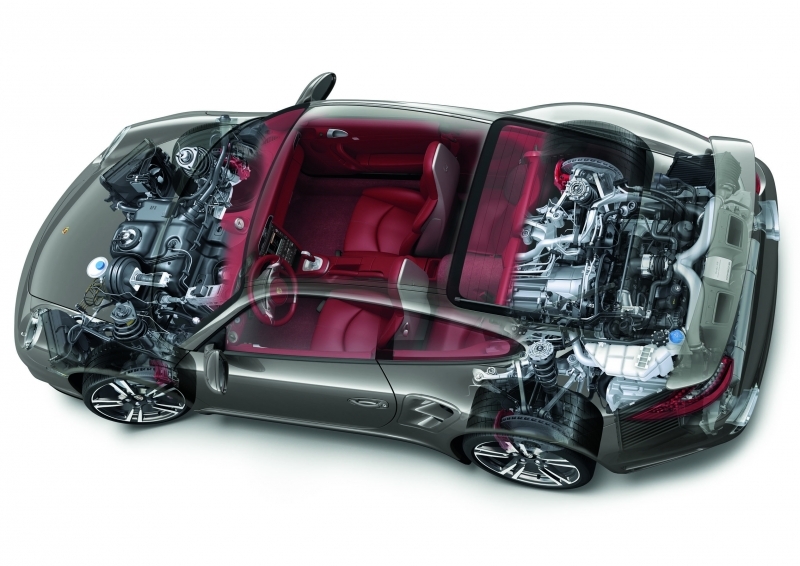 As the main focus of all 911 models, the Turbo’s engine is almost unrecognizable from the previous generation. The horizontally opposed six-cylinder boxer engine has grown from 3.6-liters to 3.8-liters, received a healthy dose of direct injection and has made use of two astoundingly clever variable-vain turbochargers that, with the help of electronics, can mimic turbos of all shapes and sizes, eliminating all traces of turbo lag. What results is a heart stomping 500 horsepower and 480 lb-ft of torque at a low 1,950 rpm, while somehow increasing overall fuel economy by a claimed 10 percent. The all-wheel drive system delivers even more tenacious grip when equipped with the optional Porsche Torque Vectoring package that pushes the car around tight corners by sending more power to the outside rear wheel. The base 911 Turbo comes with just the right amount of standard kit, including beautiful LED daytime running lights, crisp Bi-Xenon headlamps that, for a few pennies more, can peer around tight bends using their Dynamic Cornering option. If you’re really looking to collapse a lung you can opt for the Sport Chrono Package, which adds an electromagnetically stiffening engine mount system to sharpen driving dynamics, an over-boost function that pushes initial torque from 480 lb-ft to 516 lb-ft at 2,000 rpm. Be warned, it also adds a questionable dash mounted lap timer. The optional seven-speed PDK double-clutch transmission is a must-have in our book, its lightening quick shifts increase both performance and fuel economy with a flick of the steering wheel-mounted paddles. While the Turbo is geared toward out-and-out performance overall, creature comforts have not been forgotten. 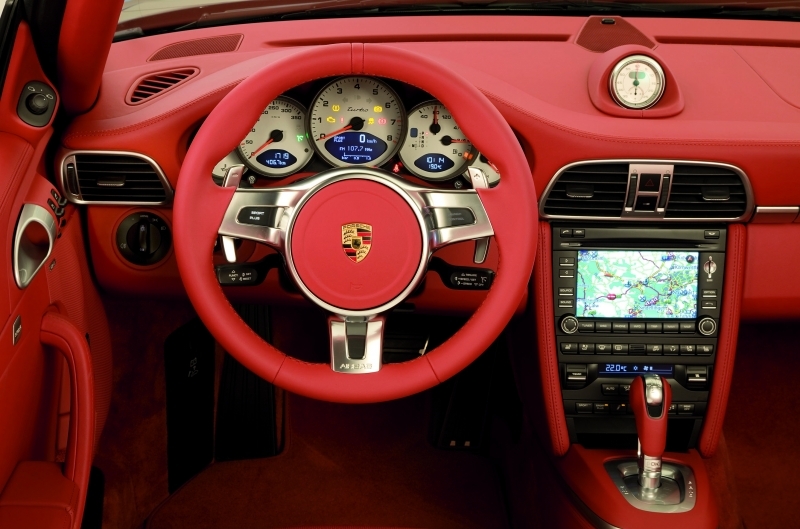 The Porsche Communication Management system comes standard on all 911 Turbos and features a 6.5-inch touchscreen navigation system that can be easily controlled via optional voice activation. The system also contains an integrated 40 GB hard drive for storing music from the six-disc CD changer. Music fills the cabin through 13 Bose surround-sound speakers in the Coupe and 12 in the Cabriolet. Bluetooth hands-free calling and iPod connectivity are also available as options. As of writing this, MPG estimates have not been released, but with the addition of direct fuel injection, the PDK transmission and an overall lighter curb weight, the 911 Turbo is said to have cut emissions by 10 percent from the last model and received an LEV-II emissions rating. All told, this makes the 911 Turbo one of the most efficient cars of its kind, despite cranking out more power than its predecessor. The leather-clad interior is as high quality as you’d expect from an exotic German car of this kind and is almost as rewarding as the drive itself. A clean gauge set centered around the tachometer can be seen through the perfectly positioned three-spoke steering wheel and does well to remind drivers of the car’s capabilities. The hip-hugging sport seats are supportive without being uncomfortable. As with every 911 model, the newest Turbo puts a modern twist on the classic appearance. The dramatically sloping rear deck, raised headlight position and rear spoiler remain as characteristic elements of the car’s history. The most dramatic exterior changes include a removed rear wiper, LED taillights and larger exhaust pipes. Pricing for the base 911 Turbo Coupe stands at $132,800, while the drop-top Cabriolet comes in at $143,800. But with a myriad of options, expect the price to climb quickly. Given the power and price, the Turbo stands in a distinguished performance crowd with the likes of the $146,000 Audi R8 5.2L V10, $102,100 BMW M6, $74,285 Chevrolet Corvette Z06 and even the $269,000 Aston Martin DBS. But no matter, given the power, poise and daily drivability, the Porsche 911 Turbo stands to remain at the top of the podium, continuing its 35-year legacy. Porsche took an already fantastic car and updated it where it matters – under the sheet metal. The new 911 Turbo, while not inexpensive – expect to pay $40K more than a similarly equipped Carrera S – is, truly, an everyday supercar. 500 horsepower, all the tech in the world and a yellow paintjob with black accents make it look like a car worth twice the price. And in today's economy, that’s saying a lot.